It comes as the justices put on hold lower court rulings blocking the plan on constitutional grounds. The conservative majority granted the Trump administration's request to lift injunctions issued by federal judges against the policy while a legal challenge continues in lower courts. Liberal Justices Ruth Bader Ginsburg, Stephen Breyer, Elena Kagan and Sonia Sotomayor said they would have kept the injunctions in place blocking the policy. The justices refused the administration's request for them to decide the merits of the legal fight even before a California-based federal appeals court already considering the matter is given a chance to rule. The lawsuits challenging the policy were filed in 2017 by civil liberties and gay and transgender rights groups on behalf of current transgender military service members, including some deployed overseas with decades of experience in the armed forces, and transgender people aspiring to join the military. In 2017, Mr Trump announced a plan to ban transgender people from the military, moving to reverse a policy announced a year earlier under former president Barack Obama allowing them for the first time to serve openly and receive medical care to transition genders. Mr Trump, whose administration also has taken other steps to limit the rights of transgender Americans, cited the "tremendous medical costs and disruption" of having transgender military personnel. Last March, Mr Trump announced he would endorse a plan by then-defense secretary Jim Mattis that replaced the ban on all transgender people. The revised policy would ban the service of transgender people who seek or have undergone gender transition steps. It also would ban under certain circumstances transgender people who experience gender dysphoria, a condition the American Psychiatric Association defines as clinically significant distress due to "a conflict between a person's physical or assigned gender" and the individual's gender identity. Federal courts had blocked the administration's original policy, finding that it likely violated the US Constitution's guarantee of equal protection under the law. Various injunctions allowed transgender troops to join the armed forces as of 1 January 2018. The administration then failed to convince federal judges in Washington state, California and the District of Columbia that the revised policy was any more legally sound than the original ban as these judges found that the revised policy was merely an attempt to implement Trump's original ban. But Mr Trump's revised policy got a boost on 4 January when a federal appeals court in Washington DC sided with his administration and overturned the injunction issued by the judge there, saying the updated policy was no longer a blanket ban. That ruling had a limited effect because other injunctions covering the whole nation remained in place. Though another injunction issued by a judge in Maryland was not on appeal, the administration said in court papers the high court's action would apply to that one, too. In asking the Supreme Court to review the cases, the Justice Department said Mr Mattis and other military leaders determined that Mr Obama's policy "posed too great a risk to military effectiveness and lethality." Mr Mattis announced his resignation as Pentagon chief in December over other differences with the US President. A 2016 Pentagon-commissioned study completed before Mr Obama acted to allow transgender troops found that any impact on cost or military readiness would be marginal. 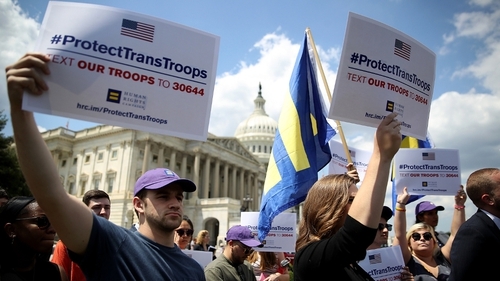 It estimated that there were around 2,450 transgender personnel actively serving in the military at the time. Not all transgender people experience gender dysphoria, according to the American Psychiatric Association, which opposes a transgender military ban.